General Hospital Spoilers: Both Kiki and Ava Pregnant – Griffin Faces Double Pregnancy Shocker? General Hospital (GH) spoilers tease that Sonny Corinthos (Maurice Benard) may lose the title of Port Charles’ most potent sperm donor. 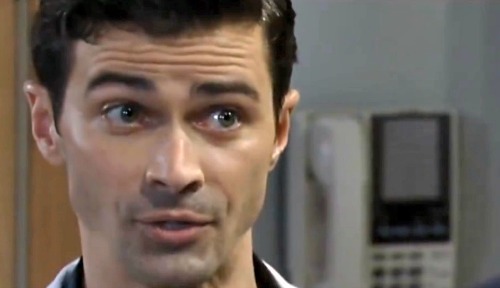 Dr. Griffin Munro (Matt Cohen) could take the top spot thanks to those irresistible Jerome women. Could Ava (Maura West) and Kiki (Hayley Erin) be pregnant at the same time and by the same man? Poor Griffin’s been in the middle of several secretive situations lately. He hid the truth about Peter August’s (Wes Ramsey) identity, which meant keeping secrets from Jason Morgan (Steve Burton), Drew Cain (Billy Miller), Anna Devane (Finola Hughes) and more. Griffin prefers honesty, but he’s piling on more deception instead. His hookup with Kiki will undoubtedly bring plenty of guilt and regrets. Griffin used to be a priest, so that could come in handy here. He’s used to keeping the secrets of his parishioners, so that’ll make him less likely to crack under pressure. Griffin’s background as a doctor is also helpful. He knows when to keep his mouth shut about confidential info. However, that doesn’t mean lying to Ava will be a piece of cake. This GH secret is a deeply personal one and it seemingly proved Ava’s fears were correct. She felt like Kiki and Griffin had a deeper connection than they were letting on. Griffin and Kiki were drunk when they indulged in a night of passion, but it wouldn’t have happened without a real spark. Nevertheless, Griffin will do his best to stay quiet. He has to think about more than just himself here. The truth could destroy Ava and Kiki’s relationship. Griffin will want to put all this behind him, but that’s not going to happen. General Hospital spoilers say this secret will ultimately be revealed and how the truth comes out could be surprising! Griffin may find himself at the center of a genealogist’s nightmare. Will both Ava and Kiki announce their pregnancies? Can you imagine the shock that’d bring for Ava? She’d be expecting Griffin’s child and awaiting the grandchild he fathered, too. Griffin will continue to struggle in the weeks ahead. He feels like he unintentionally took advantage of Kiki and betrayed Ava in the worst possible way. If this double pregnancy scenario plays out, it’ll make things even tougher. Griffin would want to take responsibility for both babies, but he’d also hate the idea of hurting Ava. Would Kiki and Griffin make a pact to lie about their kid’s paternity? Could Griffin be pulled closer to Kiki or would he stand by Ava? There’s loads of drama to explore in this potential storyline! We’ll give you updates as other General Hospital news comes in. Stay tuned to ABC’s GH and don’t forget to check CDL often for the latest General Hospital spoilers, updates and news.